A major concept that’s branded on your body after taking a Camille Brown master class is that you can get a lot out of the simplest steps by adding soul. Whether it’s injecting a little spirit into the rond de jambe that flirtatiously traces circles on the ground, the port de bras that resists each position, or the tendu that angrily pushes the floor away, Camille Brown will be a very satisfied teacher if she sees this from her students. If height were measured in spirit, Ms. Brown would be 50 feet tall. Instead, this petite woman walks into a room commanding the presence of a giant with her sparkling eyes, her articulate phrasing (words and dance) and a proud, lifted heart chakras. Every time Camille speaks, fireworks seemingly burst out of the top of her head (for an image, just think of her awesome, colorful firework-like hair) because not only does she put passion into every little thing that she says to the class, but she also does this as a proud, strong dancer with energy bursting in different directions as she speaks. I already knew of her incredibly inspiring performances, but now I know that she inspires just as much as a teacher, which in turn will create the tradition of passing her teachings on and on and on. A couple of years ago, Ronald Brown taught a master class series at Steps, and a philosophy that this master drills hard is "do the exercise correctly the first time and do it with soul". In a nutshell, he explains that you plain and simply don’t need to work as hard if you do it full out, correctly and with feeling immediately. 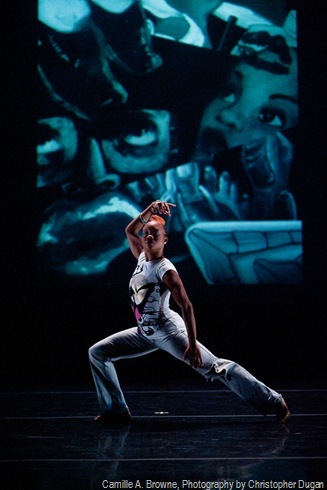 Having danced under Mr. Brown in his company Evidence, it‘s clear that she has integrated Mr. Brown’s philosophies into her teachings and preaches them in her own style. I can’t say that Ms. Brown has a short warm up (her warm-up is 1.5 hours of the 2 hour class), but she sure does keep things simple and emphasize that we should milk every movement with resistance and spirit. Of course, to be able to rise to the level of adding artistry to the exercises, you have to know the phrase well. Don’t worry, Ms. Brown will be sure that everyone has the combination by thoroughly answering questions before dancing each exercise and emphasizing vocabulary by repeating not only each exercise many times, but also integrating several of her signature African and Limon style steps into several of the exercises! I’ll confess that my upper and lower back is very tender after this Camille Brown repetition ritual. This constant succession of steps helps the dancer get to the point of muscle memory so that the mind isn’t working on remembering the steps, but on adding the icing on the steps that makes them sparkle just like Camille Brown’s movement does. It is really great to get to a point of effortlessness when studying with a “master” because this is the point when your body truly has begun to absorb the information (the vocabulary) and most importantly, the style. What we really want is for the teacher to transfer a bit of her spirit to us, and I truly believe this can only really happen if the student really understands the vocabulary so that he/she is open to accepting the gift of the teacher’s true artistry. This artistry is what made the teacher so great in the first place and, hence, rise to the place that they’ve risen. Isn’t this one of the main reasons us poor dancers dig deep in our pockets to pay the high master class rate? ($19 at Steps on Broadway!) The answer is, yes, and Camille Brown delivers 100%! Her warm up begins with a heavy focus on port de bra and upper body contractions and undulations. Ms. Brown thoroughly warms up a dancers each and every vertebrae with her intense focus on torso. Once your torso is warm, elements of African and Limon start to creep in. At one point during the warm up, after having learned several dynamic warm up progressions (including ones that combine a hard hitting charleston and "the wop" with gentle contraction progressions), Camille splits the room in half and has us repeat different exercises back and forth. Not knowing which of the 8 bar combinations the following group would be asked to do next, everyone in class is forced to be alert to everything that is happening in the room. Camille is showing us here that being totally aware of the teacher and the other dancers in the room may be something that’s a bit foreign to a lot of dancers. It’s so easy to get caught in your own head by looking in the mirror at your body or thinking about something that happened before class that day, but Ms. Brown reiterates that you must be wholly present in class. As one half of the room is finishing up a phrase, Ms. Brown hints at what phrase she wants the other half of the classroom to do next by quickly doing the first step of the phrase 4 counts before we need to begin. Each time she demonstrates, the class’ energy is rising. Her energy is so infectious as her eyes fill with fire with every word of advice, and her body shoots fire when she demonstrates. I cannot wait to see this fire onstage at The Joyce this week! Right before we exit class, Ms. Brown emphatically encourages everyone in class to join her Facebook page, get on her email list and most importantly, come to the show at The Joyce this coming week featuring her choreography along with Andrea Miller, Kate Weare, and Monica Bill Barnes. 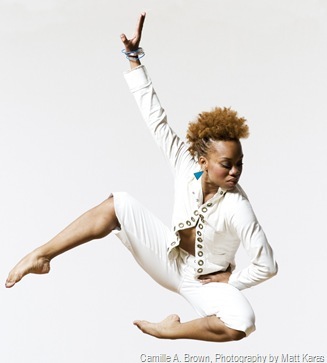 As everyone beat the ground in praise in time with her two drummers, I realize that Camille Brown’s drive to communicate with the world through dancing, teaching and choreography has built incredible momentum that is delivering her goods to a vast number of people. Most importantly, I see a genuineness of heart in her teachings and choreography, from which the people in her class and in her audience will reciprocate by readily absorbing her poignant messages with open arms. A Note from the iDANZ staff: This piece got lost in the iDANZ internet abyss, and FINALLY has been discovered. Yay!!! iDANZ Staff truly apologizes for the delay in posting this wonderful piece and hopes it brings timeless inspiration and joy.